Upgrading Oracle WebCenter Sites 11g to 12c is out-of-place—which means, you install 12c in a separate location as 11g, and move content into 12c using the Upgrade Assistant. This process copies over the content (assets) as well as the configuration from the 11g system into the 12c system. 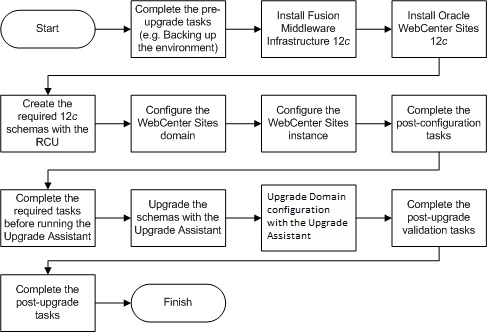 Based on the complexity of your deployment, upgrading WebCenter Sites to 12c may take several days to a few weeks. While you extensively run validation/performance tests before signing off on the upgraded 12c system, the 11g system is still serving your visitors and content contribution continues on it. During this transition, the upgraded 12c system falls behind the 11g system in terms of the content and assets that was contributed into the 11g system after the initial upgrade completed. How do you bring that delta content that was contributed into the live 11g system once the upgraded 12c system is ready? Introducing the DataDiff Migration Tool on Oracle WebCenter Sites 12.2.1.3. The illustration above shows that after the initial upgrade, content contributed into the 11g system may be migrated into the 12c system, which is still being tested, readied by the developers and admins. This helps you test your 12c system, end-to-end, with your 11g production data. Once 12c system goes live, Contributors will begin contributing into the 12c system and you may shutdown the 11g system. The DataDiff Migration Tool is an enhanced Upgrade Assistant tool to save time and effort involved in synchronizing such additions between the 11g and 12c environments any number of times. The DataDiff Migration Tool migrates artifacts—Basic Assets, Flex Assets, Flex Definitions, Templates, CSElements, Page Assets, Segments, Recommendations, Promotions, Content Query, File Resources, Dimensions, and Style Sheets. All the newly added artifacts in the 11g environment are migrated to the 12c environment. Any modified artifact in the 11g environment is migrated to the 12c environment. Artifacts that are modified in both 11g and 12c environments overwrites the 12c artifacts. Artifacts that are changed only in the 12c environment and not in the 11g environment remain intact. Changes to Users, Roles, Tree Tabs, Start Menus, and Site Navigations in the 11g environment are not migrated to the12c environment by this tool. The DataDiff Migration Tool whitepaper has the details on how to run this tool.